Conjunctival scraping can be a useful diagnostic tool as part of an ophthalmic examination. Findings are straightforward in some cases; in others, it may be appropriate to submit slides for examination by a clinical pathologist. Serial examination may be useful in helping assess response to treatment. Conjunctivitis means inflammation of the conjunctiva; a diagnosis of conjunctivitis does not help with a treatment plan. But if we can diagnose the cause of conjunctival inflammation, we are well on the way to a potential treatment. We’ve all seen the Cocker Spaniels and Bulldogs with mucoid (or is it mucopurulent?) discharge. The appearance of the discharge does not provide clues as to the cause. Fortunately, there is a limited number of causes of conjunctivitis in dogs and cats. Dogs that look like they have dry eye (keratoconjunctivitis sicca or KCS) with thick, goopy discharge, but have normal tear production may have a bacterial blepharitis. Cats with thickened, hyperemic conjunctiva could have a herpes virus infection or eosinophilic conjunctivitis. And any case with conjunctivitis of any cause can have a secondary bacterial conjunctivitis. Fortunately, you can sample the discharge and examine it cytologically. Conjunctival cytology may be performed easily with supplies that any small animal practitioner will have. 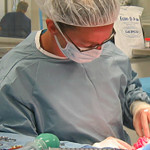 Many dogs and cats are amenable to conjunctival cytology following topical anesthetic, but it is certainly reasonable to administer minor sedation, especially when one is learning this technique. I rest the hand with the sharp instrument on the pet. That way if the pet moves toward me, it will push the object away from itself. I plan my movement so that I am always moving the sharp object away from the globe, not toward the globe. I take care to keep the sharp object oriented parallel to the surface of the cornea, or pointed away from the cornea, as an added measure of security. Apply topical anesthetic +/- administer sedation – make sure that you have performed your Schirmer tear test prior to applying the topical anesthetic. Use eye wash if necessary to rinse out excess discharge. Take the scalpel blade in the individual foil wrapper, and unwrap only the handle portion. You will use the handle portion to acquire the sample. I typically use the inferior conjunctival fornix to take my samples, one of the reasons being that the nictitans will be between the blade and the globe itself. I place the blade handle gently in the conjunctival fornix and move the blade handle toward me, away from the globe. Take the sample collected on the blade handle and distribute it onto a glass microscope slide. Then use the slide on slide smear technique to spread the sample into a thin layer of cells. To use this technique simply place a second slide on top of the first in a perpendicular arrangement and let the weight of the second (spreader) slide disperse the sample. In a smooth even motion, slide the spreader slide the length of the first slide to distribute the sample evenly. Once dry, the slide can be stained using routine Diff-Quik stain for in- hospital evaluation. No heat fixation is necessary. If the sample is going to be submitted to a pathologist for evaluation, it is ideal to submit an unstained slide, in addition to all slides that were stained with Diff-Quik at the time of collection. A conjunctival scraping from a dog or cat with no conjunctival pathology will have only conjunctival epithelial cells and mucus. The presence of inflammatory cells and/or foreign organisms indicates pathology. 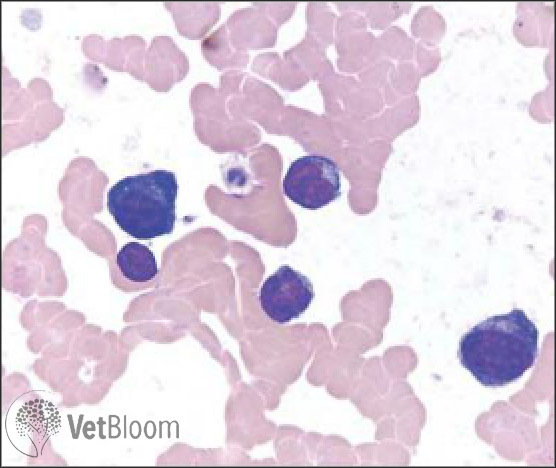 Neutrophils only: Neutrophilic conjunctival inflammation in dogs may be caused by bacterial or viral infections, allergic disease, or occasionally other causes (Fig. 2). Many dogs have thick, goopy discharge and look like they have dry eye, but have normal Schirmer tear test readings. These dogs often have bacterial blepharitis, and most will respond to a course of treatment with cephalosporins or clindamycin at same dose and duration as for any bacterial dermatitis.Bacterial blepharitis causes a qualitative tear problem, as opposed to a quantitative tear deficiency (i.e., dry eye). The pathogenesis is that a bacterial infection of the eyelids adversely affects the meibomian glands, resulting in a deficient lipid layer of the tear film. The lipids from normal meibomian glands form a film over the aqueous tear film, slowing evaporation of the aqueous layer. Disruption of this lipid layer results in premature evaporation of the aqueous tear and thus signs of dry eye. In some cases swelling in the meibomian glands of the eyelid margin will be obvious, in others this is not the case. I see new cases of bacterial blepharitis regularly and find that conjunctival cytology is often supportive of the clinical suspicion of this disease. Fig. 2: (A) Neutrophilic inflammation and hyperplastic epithelial cells. Mature, non-degenerate neutrophils are seen admixed with conjunctival epithelial cells. One epithelial cell is exhibiting binucleation (left side) and one is exhibiting emperipolesis (right side; neutrophils moving through the epithelial cell cytoplasm). (B) Immature conjunctival epithelial cells with dark melanin pigment. The melanin granules should not be confused with bacteria. A single neutrophil adjacent to the epithelial cells (top of image) is evidence of mild neutrophilic inflammation. Neutrophils and bacteria: The presence of bacteria is diagnostic for bacterial conjunctivitis (Fig. 3). However, keep in mind that we do not recognize primary bacterial conjunctivitis in dogs; it is typically secondary to another condition. The presence of a healthy tear film and ocular surface is an effective barrier to pathologic bacteria. Dry eye and bacterial blepharitis are common causes of secondary bacterial conjunctivitis.I select topical antibiotics based on the type of bacteria seen on conjunctival cytology with a Diff-Quik stain. With very few exceptions, cocci are gram positive bacteria and rods are gram negative. I typically treat bacterial conjunctivitis with a topical aminoglycoside or a neomycin/ polymyxin combination TID. 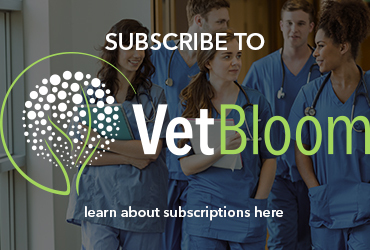 Certainly, if the patient appears to have swollen meibomian glands, it is appropriate to treat presumptively for bacterial blepharitis with a cephalosporin or clindamycin. The presence of bacteria on conjunctival cytology is a contraindication to treatment with topical steroids. Fig. 3: Neutrophilic inflammation with intracellular bacteria. Mature, occasionally lysed or karyolytic neutrophils predominate; two contain intracellular bacteria (bacilli). One macrophage is present in the lower left and one lymphocyte present in the upper right. Lymphocytes and plasma cells: Lymphocytes and plasma cells can be observed due to allergic disease or chronic infectious conjunctivitis. The presence of these inflammatory cells may also indicate pannus/chronic superficial keratitis (Fig. 4).Some cases of pannus are straightforward to diagnose, such as those presented in a German Shepherd Dog, Greyhound, Border Collie, or other predisposed breed with granulation tissue in the inferotemporal limbus. But others are not quite so straightforward. Recently, I saw a nine-year- old neutered male yellow Labrador Retriever mix dog with an atypical case of pannus. He presented for pigmentation in the inferotemporal limbus of the left eye only. Pannus was not high on my differential list after looking at the left eye, but on the right he had a 1-2 mm area of granulation tissue in the inferotemporal limbus. In unusual cases like this, conjunctival cytology can be very useful.Remember, pannus does not cause ocular pain. If you see a dog with what looks clinically like pannus but it is squinting, you need to consider an additional/alternative differential diagnosis. Pannus is one of the few indications for the use of topical ophthalmic steroids. Fortunately, tacrolimus and cyclosporine are also effective for pannus, so treatment with topical steroids is typically not necessary. In this area of the country (versus in Denver, Colorado or another area of high elevation), treatment with topical tacrolimus or cyclosporine drops or ointment BID-TID is adequate to control the vast majority of cases of pannus. Fig. 4: Lymphoplasmacytic inflammation. Two plasma cells (dark blue cytoplasm with perinuclear clear zone) and two small lymphocytes (scant basophilic cytoplasm) are present with a single free nucleus below the plasma cell on the left side. In my practice, feline herpes virus infection is the cause of the great majority of cases of surface ocular disease. 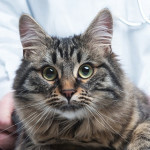 The virus becomes latent in the trigeminal nerve of cats infected when they are young, and recrudescences occur during times of stress or illness. The virus actually has more of a tropism for conjunctival than for corneal epithelium, but can affect both. Neutrophils: Cats with herpes virus conjunctivitis often have numerous neutrophils found on conjunctival scraping cytology. I recommend treatment with L-lysine 500 mg daily, Feliway, and if appropriate, an antiviral such as famcyclovir 40 mg/kg BID (a complete discussion of treatment of feline herpes virus-related ocular disease is beyond the scope of this article).Chlamydophila and Mycoplasma infections also cause neutrophilic infiltrate. Chlamydophila and organisms can occasionally be observed in cytologic samples; however, cytology is limited in differentiating these three infectious etiologies, and in determining the presence of co- infections.For cases in which a secondary bacterial infection is present, a topical antibiotic is also indicated TID. Erythromycin is well-tolerated in cats and is a good choice for cats with Chlamydophila infection. Eosinophils: Cats with eosinophilic conjunctivitis often present with thickened, hyperemic conjunctiva. 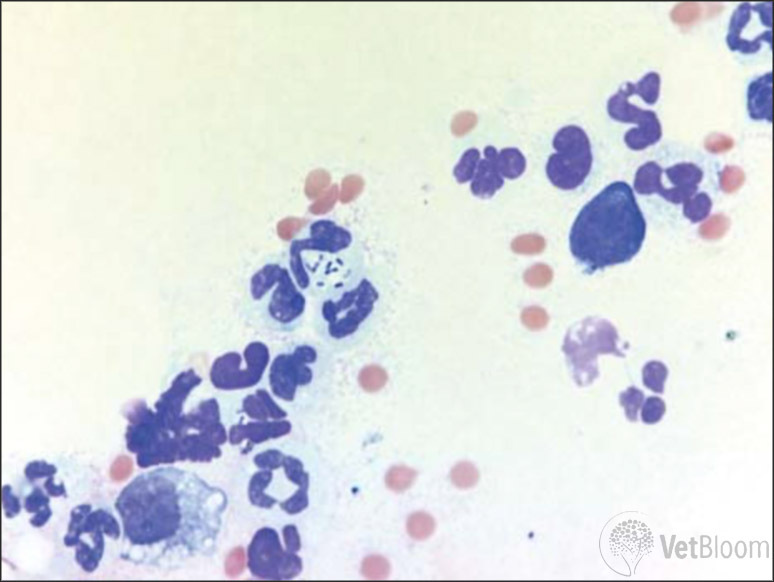 Cytologically, eosinophils are present in high number, however, mast cells and neutrophils may also be observed. The granules of eosinophils and mast cells may not always stain well with Diff-Quick stain; therefore, be cautious not to mistake free rod shaped eosinophil granules or round mast cell granules for bacteria (Fig. 5).The cause of eosinophilic conjunctivitis is unknown, but some cases are thought to be the result of infection with feline herpes virus. This is one of the few ocular diseases in cats for which treatment with topical steroids is indicated, as long as the cornea is fluorescein negative. I typically start these patients on topical prednisolone acetate 1% TID, and then decrease gradually as clinical signs are controlled. Certainly, it is a good idea to start L-lysine 500 mg orally daily, as well as Feliway, if feline herpes virus is suspected as the underlying cause. Fig. 5: (A) Eosinophilic and neutrophilic inflammation. 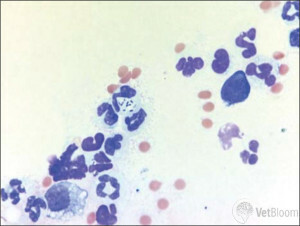 Eosinophils and mature neutrophils predominate with a ruptured eosinophil and free rod shaped granules typical of feline eosinophils seen at the top of the image. Several free lysed nuclei are present on the right side of the image and a small lymphocyte is present in the upper right corner. (B) Same case as 5A. A well-granulated mast cell (round nucleus and purple granules, left side) and an eosinophil (segmented nucleus and pink granules, right side) are present at the center. At the bottom left of the image is a squamous epithelial cell with cytoplasmic brown-black melanin granules.